Did you notice I have been missing? After three years of regular blogging all of sudden I didn't. That is because David and I went on the most amazing road trip for 7 weeks. We have been planning the trip for quite some time but I consider it foolish to announce on the web I would be traveling. We live in the middle of nowhere and our house was empty. I didn't announce the trip in advance but I have so much to share! First, the back story. 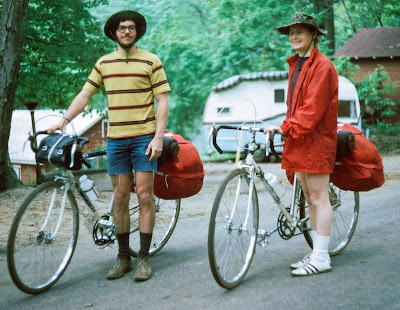 Back in 1972 David and I bicycled across the USA from Coventry, CT to Portland Oregon - 3642 miles. When we did that, we biked a direct route skipping any sites off to the side (no extra miles!) but promised ourselves that someday we would again travel America to see the magnificent things we were missing. Here we are in 1972 heading out. 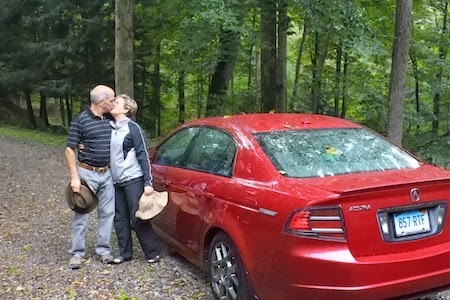 It took 41 years but we finally were able to again make a transcontinental meander across America. We set aside an 8 week period during September and October and adjusted our work schedules. We decide this was to be an unplanned, free-spirited kind of trip. We knew we wanted to reach the Pacific Ocean because we hadn't in 1972 and we had assorted friends and family we also hoped to visit. We also knew we wanted to visit as many sculpture parks as possible. So on September 5th we headed out. We had very few fixed plans and 8 weeks of time. 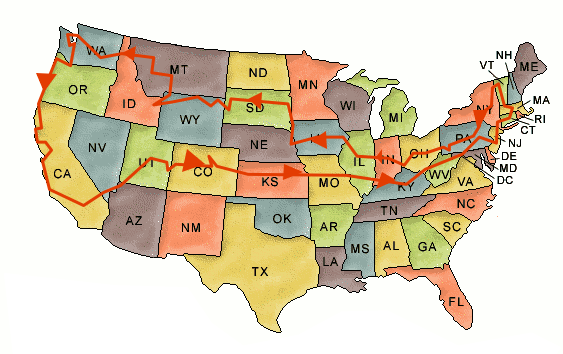 Our route took us to 27 different states, we traveled 9732 miles and were on the road for 7 weeks. We picked our route as we traveled and relied heavily on online resources to guide us and help us find last minute lodging and good food. The weather impacted decisions as did Congress and the National shutdown. I am writing a series of posts sharing the planning, the packing, on the road solutions, discoveries and photos. (We took 6000 photos and worked on editing them every night!). There is just so much to share - like how to pack 2 months of stuff including camping gear in a small sedan! Stay tuned for stories, techniques and at least a few photos. Interested in our cross country journey? Here are some additional posts about this adventure. More are yet to come. I did notice you were missing in action. Sounds like a fabulous trip--I'm looking forward to hearing more about it. How awesome and yes I did notice your amazing creations missing from my blog feed. I can't wait to read about everything you visited. That is such a huge journey. Thanks for all the nice comments. I have started posting a series on the trip so just stay tuned. More to come.